At some point in time, all of us have used one term or another to describe the horrible Minnesota weather, but #snowmageddon must be the most prominent one and the one that is having an unexpected revival. 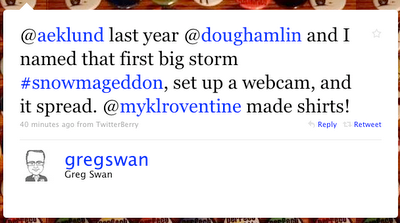 Local Twitterers Greg Swan and Doug Hamlin created the hashtag in 2008 in order to track the conversations surrounding the big winter storm that was about to hit Minneapolis. The hashatag came back several months ago and it was actually a subject of one of the first ever LOL/OMG posts . Swan must have scratched his head when he saw the hashtag became a part of national news headlines this weekend. To make things even weirder, the person responsible for promoting it is President Obama himself! Makes sense - this is what his house looks like at the moment. 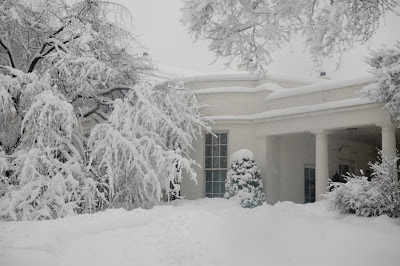 It is safe to assume that Obama was unaware of the existence of the hashtag, although as a native of Chicago he has seen a few snow storms in his lifetime. So, should we let him have it? Here's a fact: The Mid-Atlantic states are being hit by the the biggest winter storm in nearly 90 years, which is kind of a big deal for those unaccustomed to harsh weather conditions. So, yes, he can have it. That Obama, he is so cool.